The Power of Heart Rate Tracking in the palm of your hands. AccuroPT is the next Level in fitness tracking for personalized coaching and small group training. Accuracy in tracking heart rate, calories burned, training zones & intensity, all in real-time on your iPad, at your convenience. Help your clients achieve more with a connected coaching experience and personalized feedback. Our heart rate devices connect seamlessly to live display via Bluetooth from your tablet for your private and small group training needs. 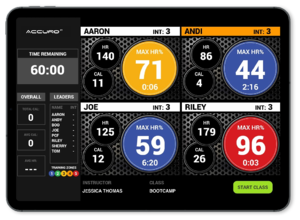 Capture data, visualize results in real-time and customize a fitness plan for your clients - you have the power to coach at the optimal intensity for their specific needs and goals.